Jessica and her husband Erick started This Old Farm in 2000 because they wanted to bring healthy food to their family and other local families as well. The operation began as an 88-acre row crop farm that they gradually converted to pasture. They have focused primarily on livestock, raising Katahdin lamb, pastured pork, and pastured poultry. They are, however, looking to increase their produce production, and have 10 acres of lettuce going out this year. Through the experience of running their own farm, the Smiths came to realize that there was a lack of resources available for sustainable farmers. In 2009, the Smiths decided to address this matter themselves by creating their own food processing facility. They decided that they could best serve the sustainable farming community by expanding their business model to include aggregation and marketing for other farms. To date, they’ve marketed for about 120 farms in total, and have 40-50 key members who come back year after year. Like the farming operation, the Smith’s food hub also focuses primarily on meat products, with only about 10 percent of their product in produce. Smith says they carry practically every meat product imaginable (except for ostrich), including beef, lamb, goat, chickens, turkey, and pastured pork. “It’s all about traceability, so we offer 100 percent grass-fed beef, and then grass-fed corn-finished beef, and then a pastured pork, and a local traditional pork. 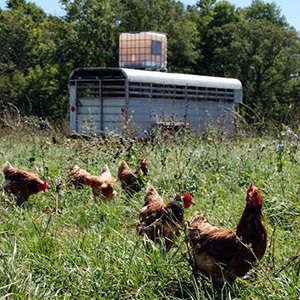 All of our poultry is raised outside— it’s all pasture-based. But some are fed certified organic grains and others are fed non-GMO grains, so we can match them all to different price points and people’s preferences as far as what they’re looking for in a differentiated market,” says Smith. This Old Farm has found success as an entirely wholesale business. They don’t manage any retail locations, but dispense their products through other wholesale distributors, grocery stores, and restaurants. Smith says they’ve remained profitable throughout the entire 14-year span of their business, with one unusual exception: a year after they purchased their original processing facility, it burned down to the ground, and they had to rebuild it. “It took us about 6 months. So in 2010 we had a complete loss and in 2011 we were building. We have a new USDA-inspected facility now,” says Smith. Besides this unusual setback, the Smiths have found their greatest challenge to be securing a steady stream of suppliers for their food hub who embrace sustainable practices. The food grown by many farms, says Smith, is already pre-purchased, contracted, or corporately owned. “I don’t think people realize how low our supply of farm-based, non-contracted food is. So that’s what we’re working to do, is to encourage small farms again. To have a place family farms feel free to market products and to grow what they want based on market demand,” says Smith. According to Smith, what keeps This Old Farm going in spite of the challenges is the fact that they are a mission-driven operation. They began with a mission of providing healthy food to their children and local families and they’ve held firm to this mission while also expanding on it. “Our mission statement is to support the family farm by offering services from education, to processing, to marketing, and distribution of sustainable farm business. So that’s our objective—to grow that,” says Smith. They are also looking to expand their facilities, so they can have a bigger impact in coming years. The Smiths are currently in the process of a build-out on their facility and are working to bring financial support into the Midwest food hub system. By 2017, they hope have 2,000 acres of produce and have a long-term goal of selling about $10 billion in locally grown meat and produce through their food hub. Despite all of This Old Farm’s expansion and big picture planning, Smith remains focused on the simple goal that started everything: the desire to provide her children with healthy, local food and the benefits that come along with it. “I wanted my children to understand how to survive and how to live. We rely on other countries instead of our own communities to feed us. It’s a broken system in my opinion all the way through, and change is definitely needed,” says Smith.